Let’s face it, this monstrous, all-electric Audi RS3 should have no problem beating a 690bhp Porsche 911 GT2 RS. Built by Audi Sport Abt Formula E team sponsor Schaeffler, the S4eP has four motors sourced from the sport, powered by a 64kWh battery (we imagine it doesn’t last all that long on a full charge). This gives a total system output knocking on the door of 1200bhp. 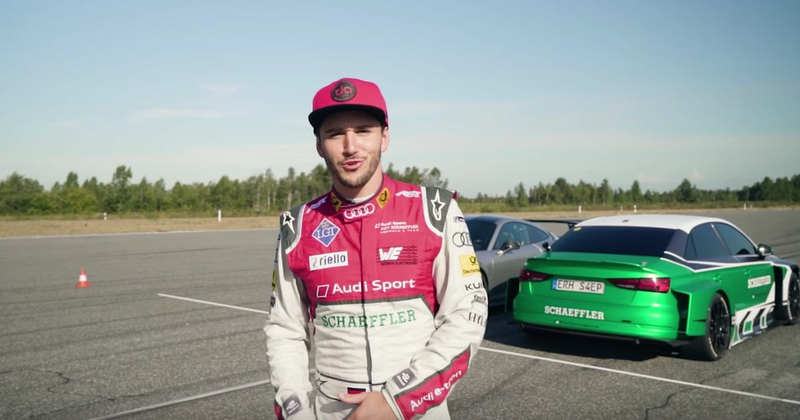 Sure enough, a video (above) released last week shows team driver Daniel Abt vanquishing both a GT2 RS and a Lamborghini Huracan Performante. But could the Audi still defeat the Porsche, while being forced to face the wrong way? Handily, we have a new video (below) to give us the answer. From a technical standpoint, the S4eP’s electric motors should be just as potent in reverse as they are propelling the car forwards. But for the driver, keeping in a straight line isn’t going to be so easy. However, forward to around the 7min 30sec mark of the video - past all gratuitous servings of slow-motion shots set to overly-bombastic music - and you’ll see it’s another win for Daniel and the S4eP. It’s worth sticking around beyond the victory, to see Abt attempt to cross the line even faster while chasing a world record, which from the cockpit looks downright terrifying.